“You are listening to KZED, 93.9 on your FM dial. I’m DJ Grant Jazzy broadcasting from the top of the KZED radio tower. I’m your eyes on the outside so you don’t have to be. I’m about to play some “Click Click, Boom” to get our day started right, but first it is time for the morning report. The firestorm continues to rage north of I-32. I can still see the safety lights around the Observatory, so everyone there should be OK. Unfortunately, I can still see no safe way for anyone to get there, but that means the walkers can’t get there either and that’s great news for our kids. On a darker note, I can see a large horde of the dead ones moving down Main Street near the library, so you will probably want to give that area a miss today if you are out and about. 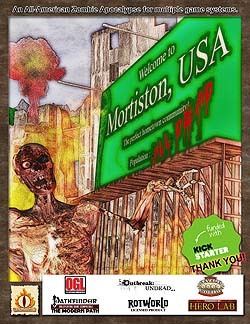 "Welcome to Mortiston, USA" is a zombie apocalypse setting for multiple licensed RPG’s, including Outbreak: Undead, Savage Worlds, The Modern Path for Pathfinder, Rotworld and OGL Modern. You already have zombies, so Welcome to Mortiston focuses on the survivors and the city itself. Inside this book you will find 29 detailed locations of interest with people to meet, items to scavenge and monsters to kill, 19 living characters are also detailed with motivations, desires, back-story, items and statistics in all the systems. These characters are not just survivors and strongholds, but major players in the eight factions vying for control of the shattered town. Finally, this book tells a sad story of death and decay spanning 191 days. The changes to the characters and locations during those 191 days are annotated in the individual entries so that each character and location is modified by the changes that occur during the story. So, Welcome to Mortiston, USA is a 4-dimensional RPG supplement that provides not only people, places and things, but also how time affects them. Welcome to Mortiston, USA can be used as an overall campaign setting. Individual locations or characters can be used to add to your own campaign setting. The story and the timeline of Mortiston, USA also provide ample scenario ideas for one-time games. The generic nature of the supplement allows Game Masters the freedom to pick and choose what they will use and how they will use it. What year is this set in? Welcome to Mortiston, USA is a modern day, post-apocalypse setting. As it is written, it must be set in the 21st century (or later) if the setting is Earth. If you are using the product in a Sci-Fi setting, like Mongoose Traveller or Chaos 6010, then the Tech Level should be equal to or greater than our current "modern day" level. Everything is detailed in the upcoming timeline of events, but in brief: a “terrorist” drives a truck full of cheap, low-tech improvised explosives in front of the deserted Mortiston All School. Inclement weather arrives, hampering the fire fighters; but soon the rain falls and the fire becomes controllable. After a few hours, coincidentally while a military train is moving through Mortiston, a second explosion occurs. This is the detonation of a professionally built suitcase nuke concealed within the truck. Although the yield of this atomic device is very small, it is enough to completely vaporize four city blocks and destroy most of the town with a firestorm that lasts for five days. What comes in the book? What else is coming for the world of Mortiston? The Electronic Expansion Packs (AKA: The EEP! ): The EEP installments will come bi-monthly, and will include new characters, locations, tables for use with Inspiration Pad Pro 2 by NBOS Software, and at least one "something special" item such as a battle map set, specialized zombies only found in Mortiston, adventure, set of paper minis, and more. Battle Maps: The Roads-2-Nowhere Map and the INN-Teriors map sets will include all the current locations in the core Mortiston world book and many (if not all) of the upcoming EEP! locations. Have an idea of something you want to see, use the Customer Support page and let us know what you'd be interested in. "Doc" Metzger", Amber Floyd, Andrew Beirne, Anthony A Davenport, Brad Vest, Brett Easterbrook, Chad 'Skrymir' Hughes, Courtney Dingles, David Crowell, David G. Harriss, David Terhune, Dirty Johnny, Drew C. Releford, Ed Kowalczewski, Eddie Conrardy, Edward Zylowski, Eloy Lasanta, James E. Deykes, James Gabrielsen, Jamison Zellers, Jeanette Starks, John D. Kennedy, Kevin Donovan, Louis Luangkesorn, Lt. Robert Adams, Lucas Murphy, Mark Hassman, Matthew McFarland, Matthew Wasiak, "Max "Snake" Savage", Michael Russell, Morgaine Fey, "Paul "The Cigar Man" Cooper", Picot deBoisfeuillet, Rafe Ball, Rhys Haig, Rick Arnold, Rick Rambo, Rob Wolfthulhu, Roberta Miller, Ryan Beyer Marsh, Sam Wong, Sara Miller, Sarah Dee, Shawn Beatty (KingZombie.com), Stacey Kaczmarek, Tarl Gallicchio, Thomas K. Putney, Thomas Krømke, Tim walker, Todd Michael David, Wes & Sherry Gassaway, and Will Howard. 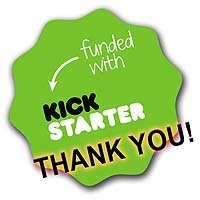 We have to give our Kickstarter backers a big hand for showing us that Mortiston was a viable idea and worth putting it all in print. Thank you, one and all.